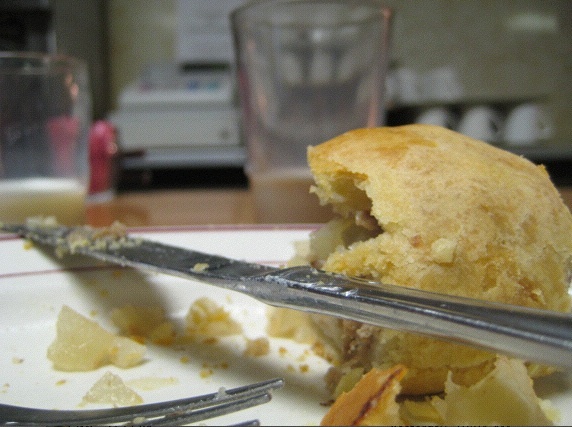 Yoop We Can: Potatoes + Rutabaga + Beef + Butter + Butter +Butter + Butter = a Pasty. This little fella’s from Wakefield, Michigan (Photo: Tim Murphy).Emporia, Kansas—The most out-of-place coffee shop in the United States, so far as I know, is in Cairo, Illinois. I’m a little less certain about the greasy-spoon equivalent, but so far I’d cast my vote for The U.P.Er’s Diner in Emporia, a short walk from the red sandstone home of William Allen White*, and approximately 900 miles southwest of its target audience. Since we left Michigan’s Upper Peninsula (or “U.P.”), more or less everyone we’ve met who’s so much as heard of the U.P. has had a story about the place, or at least a shared reaction: “Oh man, you went all the way up there?”; or “That place is insane!”; or “Da U.P, eh!” Even in Duluth, which shares the same iron ore heritage and Superior lakefront, the U.P was spoken of in excited tones, as if it were some sort of bizarro sub-culture totally disconnected from the rest of the Northland. Which it kind of is. The U.P.Er, founded by a transplant from Iron Mountain, is an odd fit for Emporia. There’s not an especially large community of Yooper ex-pats in the Flint Hills,** and I can imagine a sizable number of pedestrians have no idea what the giant, green, vaguely sea-monster-shaped landmass on the sign outside is even supposed to be. In its own way, though, it’s the quintesential Yooper creation, because it carries with it this outsized sense of place, as if the peninsula and its cuisine were something that all Kansans should just be instinctively familiar with: Thai, Tex-Mex, Tapas, Yooper. You know, Yooper. From da U.P.! The whole place is a shrine to Yooper culture, with maps and old black-and-white photos and pictures of fish covering the walls; I wouldn’t go so far as to say Yoopers should have their own state, but the state of mind is undeniable. I’d be remiss, too, if I talked about the the U.P.Er without making note of the 5,000 Year Leap known as the “pasty,” which I’ve been meaning to mention since Marquette. The pasty is the national cuisine of the Upper Peninsula—basically a flakier, greasier, Midwestern-sized empanada, which looks kind of like one of those turtle shells from Mario Kart, and tastes like…well, you’ll just have to try it. Pasties were introduced to the U.P. by Cornish miners in the 19th century and then, through some sort of catastrophic failure of the free market, more or less stayed put. Despite their great taste and total absence of nutritional value (two values that’ll usually take you pretty far in America), you can’t find a pasty anywhere outside northern Michigan. *Among the more fascinating stories involving White: He, along with Einstein, Teddy Roosevelt Jr., Theodore Dreiser, Thomas Mann, and Eugene O’Neill, formed the core of the committee that produced the first-ever English translation of Mein Kampf for the Book-of-the-Month club. He also ran for governor on the one-issue platform of kicking the KKK out of Kansas. William Allen White! **Actually, there isn’t an especially large community of Yoopers in the U.P., either.